You'll be £12.00 closer to your next £10.00 credit when you purchase Hard Fighting. What's this? 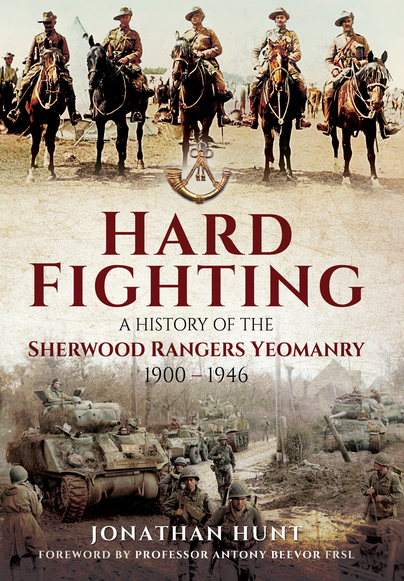 This account, following on from Unicorns - The History of the Sherwood Rangers Yeomanry 1794- 1899, covers the Regiment’s war service between 1900 and 1945. During the Boer War the SRY formed part of the first volunteer unit to see active service overseas fighting the Boer Commandos as cavalry. For its role in the ill-fated 1915 Gallipoli campaign, the Regiment was awarded the King’s Colour and then fought Allenby’s victorious campaign against the Turks. During the Second World War the Regiment initially saw service in Palestine, at the siege of Tobruk and the fall of Crete. After acting as Special Forces in Ethiopia, they were converted to armour and fought through from Alamein to Tripoli before returning to North-west Europe for D-Day and the advance to Germany. In so doing they won thirty Battle Honours and 159 awards including eighty-three for gallantry. General Sir Brian Horrocks later wrote ‘no armoured regiment can show a finer record of hard fighting.’ Hence the title of this invaluable regimental history. A must for anyone interested in the Sherwood Rangers. A great book especially if one has an interest in The Regiment. Mine being the campaign in Europe. Hunt has brought together a great collection of stories from the various histories and diaries of those who served. Some I'd known and some I'd not known and was delighted to read. This book is a must as this Regiment probably saw more action than any other during the entire war...a great story of men put in a terrible situation and doing their best . This 'most happy family'. ... I am hard pressed to recall a regimental history as well written. Highly recommended.